Lay person of the diocese of Campanha, Brazil. Her mother died when the girl was 10, and she gave herself over to the care of the Blessed Virgin Mary. Never learned to read or write, never joined a congregation, but lived an impoverished, celibate life like a modern anchoress in Baependi, Brazil, devoting all her time and effort to the construction of a church dedicated to Mary. Educated in Syracuse, Sicily. While in Constantinople to seek a position at court, he felt the call to enter the religious life. Built a monastery and started a monastic community on the island of Chinos. Soon after finishing construction, Methodius was summoned by the Patriarch of Constantinople to help govern the diocese. The Eastern Church was debating the use of icons in worship and as tools to bring the faithful closer to God. Methodius and the Patriarch of Constantinople worked against the iconoclasts, and together suffered nearly as much abuse as the images. They worked to unify and reconcile the sides. Methodius travelled to Rome, Italy to seek the Pope's help; during his absence, he was exiled. After seven years, he returned as Patriarch of Constantinople in 842, and continued to work for unity. May have been related to Saint Kevin of Glendalough. Spiritual student of Saint Enda of Aran. 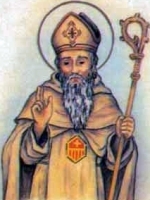 Tutor and catechist to Saints Cantius, Cantian and Cantianilla of Aquileia. To escape the persecutions of Diocletian, he moved with the family to Aquileia, Italy. However, the authorities there quickly ordered them to sacrifice to idols; they refused. Martyr. Old Testament prophet of Israel on whom, by Divine command, fell the mantle of Elias the Prophet. Accompanied Elias until the latter was translated and his prophetical power was confirmed by many miracles, among them the raising of a child to life and the cure of the Syrian general Naaman of leprosy. Sixth century woman who early in life dedicated herself to God. Founded a monastery in the area of her village. Lived at Soissons, Gaul (in modern France). May have been a missionary from Rome, Italy. Fled during the persecution of Diocletian, but was captured. When brought to court, he made a bold, public statement of faith. Tortured and martyred with Saint Rufinus. Born to the Spanish nobility. Married to Captain Rodrigo Diaz de Andrade. Widowed c.1245 when the captain died fighting the Moors in Granada. Franciscan tertiary, spending the rest of her days in prayer and pious devotions. For preferring a life devoted to God over marriage to a young imperial Roman nobleman, she was martyred in the persecutions of Valerian. Lived at Soissons, Gaul (in modern France). May have been a missionary from Rome, Italy. Fled during the persecution of Diocletian, but was captured. When brought to court, he made a bold, public statement of faith. 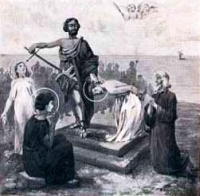 Tortured and martyred with Saint Valerius. Bishop of Naples, Italy in the mid-4th-century. Fought to keep Arianism out of his diocese. Benedictine monk at the monastery of Saint Emmeram in Regensburg, Bavaria, Germany. First bishop of Meissen, Germany in 968; he only served about a year. Established the Cathedral Chapter in Meissen. Born into a Berber family. Monk at Asturias, Spain. Monk at the double monastery of Tábanos. One of the first three martyrs of Cordoba, Spain, killed for their faith by order of the Moorish caliph. Joined the Mercedarians in Valladolid, Spain. His reputation for piety and devotion to the faith led to his being chosen bishop of Aghadoa, Ireland by Pope Benedict XII. Deacon of the church of Saint Acisclus in Cordoba, Spain. Monk at the double monastery of Tábanos. Priest. One of the first three martyrs of Cordoba, killed for their faith by order of the Moorish caliph. Courtier to Blessed Charlemagne. Left court life to become a monk at the abbey of Fontenelle in Normandy, France. Bishop of Evreux, France in 787. Late in life he resigned his see and returned to life as a monk at Fontenelle. Lay woman, married to Santuccio Sanfonerio, a lawyer at Sant'Angelo in Vado, Umbria, Italy. Franciscan tertiary. Widow. Noted for the sanctity she brought to her every day work. Layman of the archdiocese of Dublin, Ireland. Nun at the double monastery of Tábanos. One of the first three martyrs of Cordoba, Spain, killed for their faith by order of the Moorish caliph. Monk at the monastery of Saint Vannes, Verdun, France. Monk at Dyfed, Wales, in Anglesey, Wales, and in Brittany in northern France. Spent several years in captivity in Ireland. Hermit on the Isle of Badsey, Carnarvonshire, Wales. Abbot of Bellach-Duin (now Castle Kerrant), County Meath, Ireland. Seventh-century bishop of Vienne, France. Seventh-century abbot of monasteries on the Isle of Arran and the Isle of Bute in Ireland. Archbishop of Salzburg, Austria for 32 years from 991 till his death. Confessor of the faith in Zeganea, Laziqia (in modern Syria). No details of his life have survived. Fourth-century bishop in southern Italy.